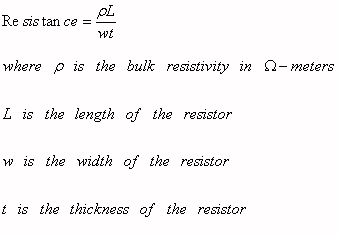 This page also explains the concept of sheet resistance and conductivity. The distinctions below are in common usage but may be seen as arbitrary since there is no industry standard that can be applied here (perhaps IEEE will someday come up with one). You can also check out our page on conducting materials. Insulating materials have tightly bound electrons (usually eight) in the outer shell that are happy to remain there even in the presence of high voltage electric fields. Semi-insulators have bulk resistivities between 103 to 1010 ohm centimeters. Cut fresh from the boule, GaAs wafers are said to be semi-insulating. Semiconductors have bulk resistivity in the range of 10-4 ohm-cm (heavily doped) to 103 ohm-cm (undoped, or intrinsic). That's seven orders of magnitude! Semiconducting elements include silicon and germanium, it is no coincidence they are both from group 4 of the period table. Semiconducting compounds include gallium arsenide, indium phosphide, and gallium nitride, from groups 3/5 or 2/6 of the period table. Semiconductor materials have 4 electrons in their outer shell (it's half filled). When bonded together in a crystal lattice, atoms share electrons such that they each have eight electrons in the outer shell. Electrons are somewhat loosely bound so they can become carriers in the presence of an electric field. To be considered a conductor, a material must have a bulk resistivity within the range of 10-6 to 10-4 ohm-cm. Conductor materials have loosely bound electrons (one or two) in the outer (valence) shell that can move easily under the influence of a voltage to form current. Conductors include elemental metals such as copper, gold, silver, aluminum. Heavily-doped semiconductors can also be considered conductors. Content moved to a new superconductor page. This concept is further explained on our page on resistor mathematics.